Lewis Hamilton drove home to a race win from pole position under the lights at Singapore, extending his championship lead over Ferrari driver Sebastian Vettel even further. Singapore is one of the races that always sounds like it’ll be a good time—and it’s definitely a fun race to watch, being one of the few night races on the calendar—but pole position is crucial at a track like this. Mercedes were more than happy to flex a little bit when Hamilton took pole position on Saturday ahead of Red Bull’s Max Verstappen. The first person into the first corner has the advantage. And when the lights went out, that person was Hamilton. Sebastian Vettel made a solid pass on Verstappen on the first lap that could have stuck, had there not been a safety car. Force India (or we supposed to call them Racing Point now?) 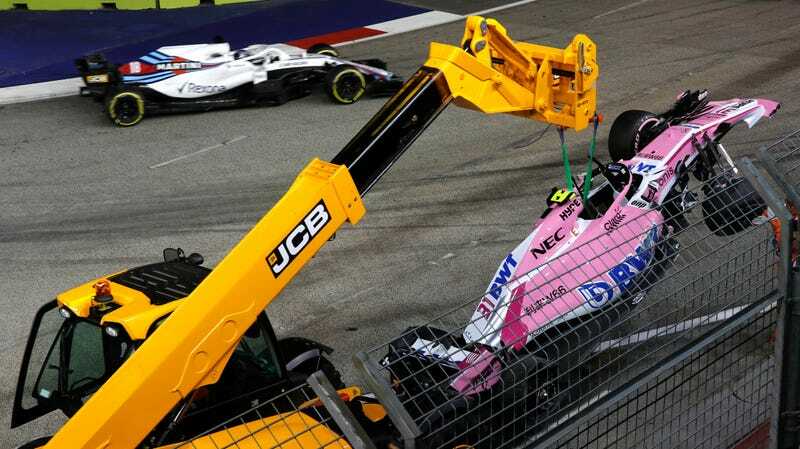 driver Sergio Perez collided with his teammate Esteban Ocon, sending the Frenchman into the wall and bringing out a safety car for the first four laps. The early safety car took its toll on all those meticulously planned tire strategies. When Verstappen pitted, Red Bull was able to complete it so quickly that their driver entered the track ahead of Vettel, where he’d stay for the rest of the race. All things considered, it wasn’t a particularly spectacular race up at the front. The action was taking place near the rear of the pack, where Perez again crashed into Williams’ Sergey Sirotkin. Sirotkin was able to continue, but Perez sustained a ten-second time penalty. Then Sirotkin took the battle to Romain Grosjean as Hamilton was forced to slow behind them as he made efficient work of lapping much of the field. It looked like Verstappen would be able to capitalize—he closed up on Hamilton real quick. But getting stuck behind the Williams and Haas battle didn’t do him any favors. He was able to slip by, but he never got closer than two seconds back from Hamilton. Vettel had to be content with a meager third place. His win means Hamilton extends his championship lead to forty points over Sebastian Vettel, whose simple mistakes all season have begun to take a toll. Other notable drivers include Fernando Alonso, who managed to finish in seventh, the best finish for McLaren since April, and Charles Leclerc, the Sauber driver who will be heading to Ferrari, who scored points by finishing in ninth place. The World Championship fight looks like it’s a done deal at this point. Lewis Hamilton has been damn near perfect all season long, and Sebastian Vettel’s slow accumulation of mistakes has seen him lose his advantage. Barring disaster, Vettel might just have to content himself with runner-up.